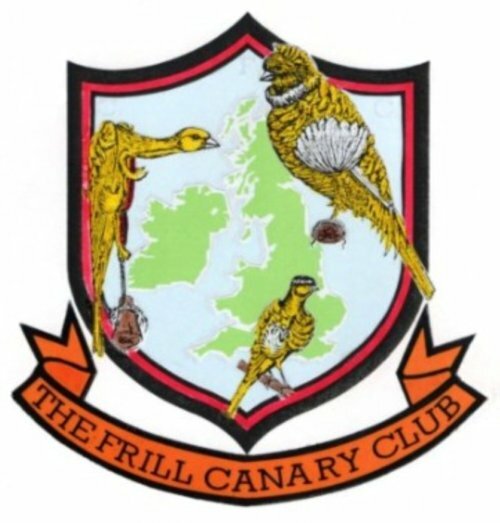 Welcome to the official website of The Frill Canary Club , a specialist Club formed to promote the keeping , breeding & exhibiting of Frill Canaries in a sound , ethical and healthy environment. These unique canaries have a long & interesting history within the world of exhibition canaries , first being mentioned in text dating back to the 1800's. The principal characteristic of all of the frilled breeds is the curling of the feathers into a distinctive pattern which is basically the same in each case, namely, (a) the "mantle" formed by the feathers of the back being divided by a central parting and curling over each shoulder like a cape; (b) the "jabot" (or "craw", or "waistcoat") formed by the breast feathers curling inwards towards the center in the form of a frilly shirt-front, or closed shell, and (c) the "fins" formed by bunches of feathers above the thighs curling outwards and upwards around the wings. Differences between the breeds range from the voluminous and dense plumage of the Parisian Frill and the size of the AIG (the largest of the breeds) to the sparse and crisp feathering of the Gibber Italicus (the smallest). Stance and position in the show cage also varies from breed to breed. The Frill Canary Club caters for breeders and exhibitors of the Parisain Frill , AGI , Padovan (in both crest & plainhead ) , North Frill , Fiorino ( crested & plainhead) , Mehringer , South Frill , Swiss Frill , Gibber Italicus , Giboso , Melado Tinerfeno and Rogetto .